On the first day of the 114th Congress, 60 senators introduced a bill that would approve construction of the Keystone Pipeline. Lawmakers in the House will likely take up the issue on Friday. President Obama, however, didn't share the same enthusiasm, threatening to veto the bill if it arrived on his desk. 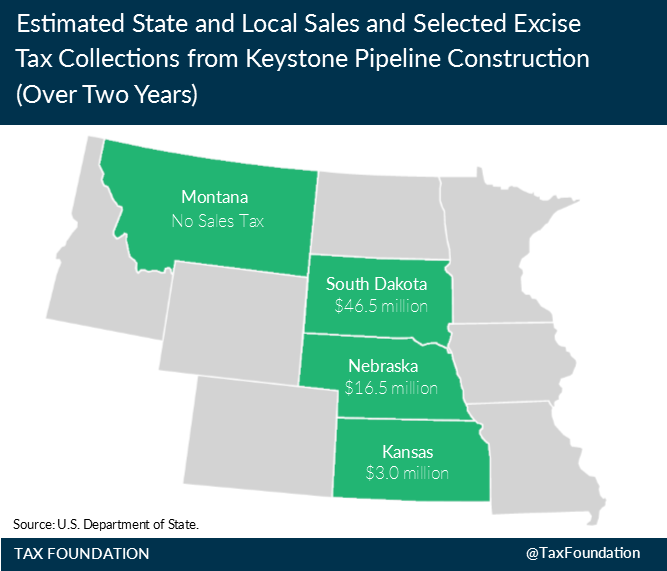 Regardless of your opinion on the Keystone Pipeline, there is no doubt that the project would have state and local tax impacts, during both initial construction and post-construction operations. A report published by the U.S. Department of State in January of 2014 outlined the environmental impact of the project and other associated issues—including the estimated state and local taxes collected as a result of the project. The "report" is actually an expansive environmental impact assessment tome with 8 chapters and 26 appendices contained in 95 PDFs. Tax information is included in the Executive Summary and Chapter 4, Section 10. Here's a brief overview of the tax-related nuggets in the report. Note that here we only include state and local tax-related concerns. We do not include a discussion of the impact on state and local public services during construction or operations of the pipeline. We also do not include "connected actions" (smaller projects associated with Keystone Pipeline construction). Which state coffers would this impact? What types of taxes would be paid during construction? The State Department outlines the construction impact on local property taxes, state and local sales taxes, and certain state and local excise taxes. Property taxes in impacted states would increase as a result of the eight construction camps that would be built by the construction company to accommodate the influx of workers needed during construction. There would be four in Montana, three in South Dakota, and one in Nebraska. During construction of the proposed Project, situs taxing entities [locations containing proposed Project facilities within their legal boundaries] such as county governments, school districts, and special districts would be able to assess and tax the taxable property of the eight construction camps. Property tax collection estimates during Keystone construction are shown in the regional map below (click to enlarge). The report makes note of the important caveat that the estimates were derived using methods that “necessarily stylize and simplify the values and calculations that state and local governments would take to value and tax real property in actual practice." True of most models, but important to acknowledge. [O]ther revenues generated by the proposed Project during construction would be sales/use and fuel taxes levied on goods and services purchased during the construction period. This would include, for example, taxes from construction materials and construction worker spending in the local economy for basic living expenses such as food, housing, gasoline, and entertainment. This type of tax revenue would last only as long as the seasonal construction was in progress, or for up to 2 years. These construction sales and excise tax estimates are shown in the regional map below (click to enlarge). For details on what’s included in these estimates, see here. What types of taxes would be paid during operations (post-construction)? And how much? The State Department estimated that once construction is complete and full operations begin, a total of $55.6 million in property taxes would be collected each year by local governments containing pipeline and pipeline facilities. In particular, these would be "levied on proposed Project facilities by county governments, school districts, and other taxing entities in situs counties." 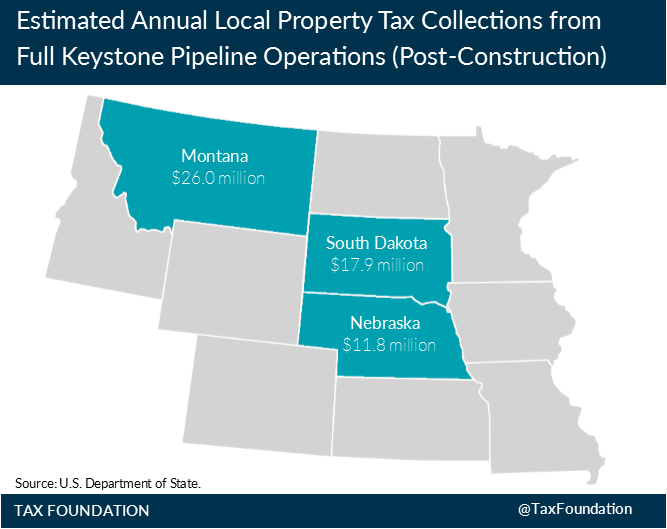 The report provides a chart breaking down the estimated property taxes that would be collected annually in Montana, South Dakota, and Nebraska once the pipeline was fully operating. We've put together a regional map comparing the three states, which is below (click to enlarge). 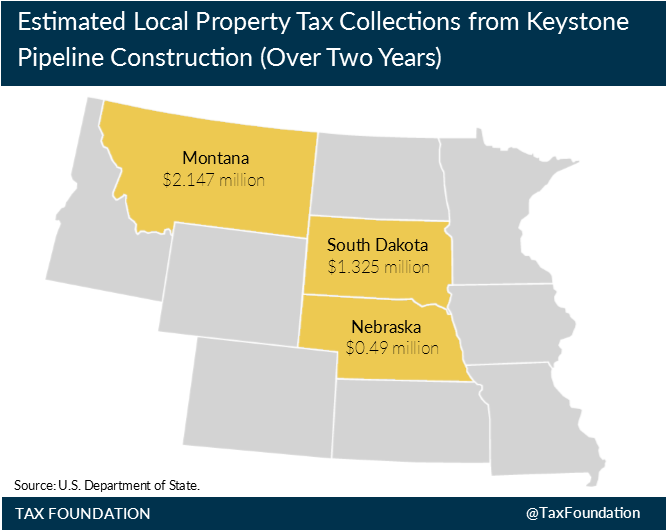 Montana local governments would collect the most in property taxes ($26.0 million), followed by those in South Dakota ($17.9 million) and finally those in Nebraska ($11.8 million). Again, there's an important caveat (which the report again smartly points out): that property tax revenues would vary from year to year due to a number of factors. Further, Nebraska has a personal property depreciation allowance, meaning that property tax collections in Nebraska will likely decrease over time. Additionally, the model uses general trends to generate estimates. You can read the entire report here. Follow Liz on Twitter @elizabeth_malm. More on Montana here. More on South Dakota here. More on Nebraska here. More on Kansas here.